Clarence Kumpf, 95, of Leigh, died Wednesday, May 23, 2018, at Faith Regional Center in Norfolk. Funeral Service Tuesday, May 29, 2018, 2:00 P.M.
Tuesday one hour prior to the service at the church. 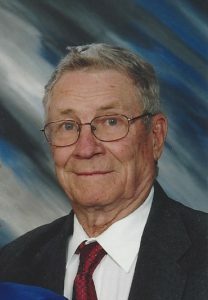 Clarence was born February 13, 1923, in Leigh, Nebraska to Edward and Hulda (Loseke) Kumpf. On June 9, 1953, he married Lilas Franzen at Zion Lutheran Church in Leigh. They lived in the Leigh area and Clarence worked for Hanel Oil Company, Colfax County and owned and operated his own dirt moving business. Clarence served in the United States Army, the Pacific Theater, during World War II. He was a member of Zion Lutheran Church, Sucha Post 302 of the American Legion, and the Leigh Saddle Club. Clarence loved horses and rodeos. He also was know to play cards, but only for "blood", not for fun. He loved spending time with the family, visiting friends and following the grandkids in all their activities. Clarence is survived by his daughter, Susan (Richard) Eikmeier of Dodge, son Dale (Sharon) Kumpf of Leigh, one brother, Carroll Kumpf of Norfolk, sister-in-law Aletta Kumpf of Lincoln, five grandchildren; Travis and Misty, Cory and Annie, Ryan and Makayla, Dana Eikmeier and Haley Eikmeier and several nieces and nephews. He was preceded in death by his parents, wife Lilas and three brothers; Gordon, Harry and LeRoy (Pee Wee) Kumpf.